Drum winches have been developed in recent years. The requirements from sport boats continued easy and fast anchoring. Especially with smaller and medium motor boats, a remotely controllable anchor system is requested. The drum winches can be completely operated from the cockpit or even via radio remote control. With a strong electric motor, the anchor line is wound onto a drum and remains stored until the next use. In this case, one end of the anchor line is direct connected to the drum winch. For the different boat sizes up to 14m there are corresponding models. 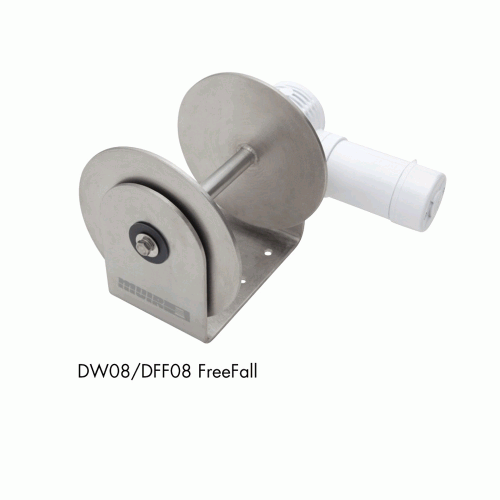 With the DW series, the anchor can be lowered and retrieved by a motor. The DFF series has a free-fall function. When you release the anchor by a short press on “DOWN” the drum is disengaged and the anchor can fall freely to the bottom. If the anchor does not fall anymore, the key “UP” may be briefly pressed to engage the mechanics. The drum winches are intended for installation in the chain locker. The drum is made of stainless steel and the motor with gear is suitable for the harsh environment in the anchor box.